In some magical traditions, people build a shrine to the deity they’ve chosen to honor. While this is slightly different than an altar, it serves a similar purpose. An altar, for instance, may be dedicated to a specific deity or theme, but it is often set up as a workspace as well, to be used in ritual and spellwork. A shrine, on the other hand, is generally used only as a place to pay tribute to the selected deity. In some religions, shrines are incorporated to honor a saint, demon, ancestor, or even mythological hero. Shrines are also, in many cases, much larger than the simple altar. A shrine can take up an entire room, a hillside, or the bank of a river. The word “shrine” comes from the Latin scrinium, which refers to a chest or case used to store holy books and tools. In many Pagan traditions, practitioners choose to have a shrine to the deity of their path or a household god. This is often left in a place of permanent honor, and may be near the family altar, but not necessarily. If, for example, your patron goddess is Brighid, you might set up a small shrine near your fireplace, in celebration of her role as a hearth goddess. You could include a Brighid’s cross, a corn doll, some statuary, candles, and other symbols of Brighid. Often, a shrine is a place where people hold daily devotional prayers and make offerings. "The [Pagan temple] concept seems modeled on the Christian concept of a church. But if we look back at ancient pagan places of worship, many of them looked less like community centers, and more like what I would call “shrines.” For many Western religions, these two functions are merged in one building. And when Pagans talk about building “temples,” we often follow this model, which unifies the community center with the shrine. It’s another manifestation of the conflation of “church” with “religion." In some religions, the shrine is actually the centerpiece within a temple or larger structure. A church or building might be constructed around a holy well, a sacred relic, or other object associated with the spiritual teachings of the religion. Some Catholics have small outdoor shrines in their yards, which include a small alcove featuring a statue of the Virgin Mary. Followers of cults in the ancient world often made pilgrimages to holy shrines. In Rome, a shrine to the fire god Vulcan, or Volcanus, was erected at the foot of the Capitoline Hill by the emperor Titus Tatius. Centuries later, after much of Rome burned to the ground, an even bigger and better shrine was built by Domitian, on the Quirinal Hill, and offerings were made to keep the city safe. Many of the temples in the classical world were erected around small shrines. Sometimes, shrines pop up spontaneously, at places which have spiritual significance to people. For instance, in the 1990s, a bank office in Clearwater, Florida, became a spontaneous shrine when people claimed to see an image of the Virgin Mary in the building's windows. Faithful believers came from all over to leave candles, flowers, and prayers at the site until several windows were shot out in 2004 by vandals. The shrine had become especially important to the local Hispanic community, who saw the image as the Virgin of Guadalupe, the patron saint of Latin America. If you’re part of a modern Pagan tradition, you might want to set up a household shrine honoring either the gods of your tradition, your ancestors, or other spirits to whom you wish to pay homage. 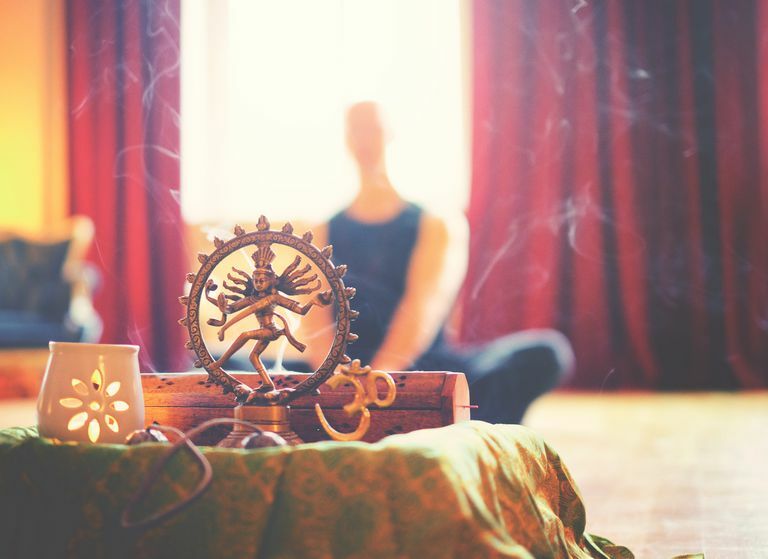 To create a deity shrine, include statues or images of the god or goddess you honor, along with symbols that represent them, candles, and an offering dish. If you want to set up a shrine to your ancestors, use photos, family heirlooms, genealogy charts, and other symbols of your heritage. Sometimes, you might even want to build a shrine that has a specific purpose. In some magical traditions, for instance, people use healing shrines. If you decide to do this, you may want to think about including an image or photo of the person who needs to be healed, along with magical herbs and crystals associated with healing. For a healing shrine set up for general wellness, use blue candles–blue being associated with healing–and herbs such as chamomile, feverfew, and eucalyptus, just to name a few. You can also methods of creating healing sounds, like a singing bowl, a rainstick, or other methods of making sacred sounds.